Correction! Save the Dates for West River Trail Workdays! 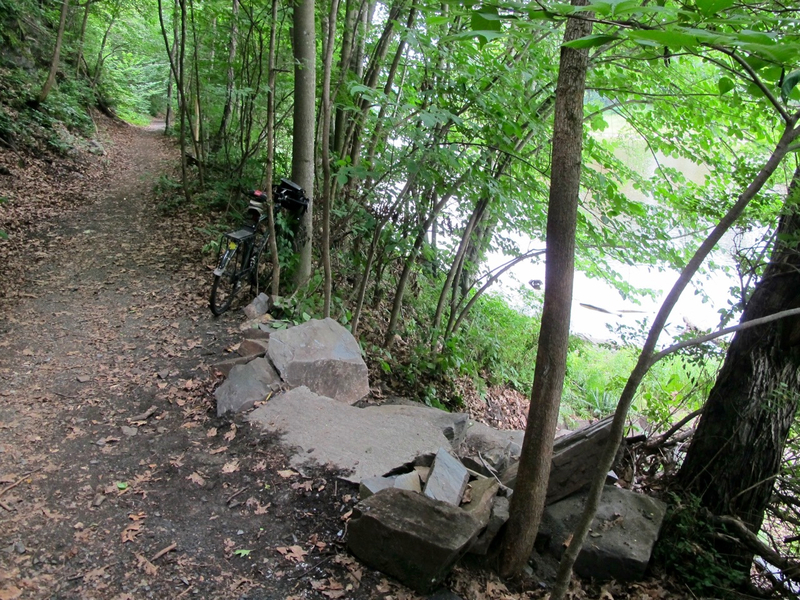 Remove/control Japanese Knotweed on the cobblestone shoreline of the Riverstone Preserve. Meet at the Marina Trailhead. Bring water, work gloves, snack, bug dope, wear work boots. We have tools, but bring your own if you prefer–shovel and loppers. Help keep the Riverstone Preserve beautiful and able to support its native plants! Contact pcameron@brattleboro.org for more information on the June 9 workday. Meet at the Fox Farm Rd access. We will replace a culvert, work on drainage issues and do more work on removal and control of invasive plants. More information to come. Contact jason.cooper10@gmail.com for more information on the July 23 workday. Many hands make light work! Please join us! See previous post for details. Contact pcameron@brattleboro.org for more information on the June 9 workday. Contact jason.cooper10@gmail.com for more information on the July 23 workday. I walked on the new Riverstone Preserve trail yesterday, along the shoreline, that the VYCC crew created. It’s lovely! But I missed the new steps! Are they hidden? Here’s an invitation to come out on the West River Trail and find the mysterious new stone steps. When you find them, let me know where they are! If you’re out on the trail this gorgeous sunny summer morning for the monthly I-91 Bridge Project Trail Talk, why not continue on to see the beautiful stone steps created earlier this summer by the VYCC crew. Thanks again to the crew from the Vermont Youth Conservation Corps (VYCC) for their hard work building the new steps at the Riverstone Preserve on the lower section of the West River Trail. Beautiful work! Thanks to Alex Wilson for the photos of the steps and to Jason Cooper for the crew photo. A big thanks to the fabulous crew from the Vermont Youth Conservation Corps (VYCC) for their good work building the new steps at the Riverstone Preserve on the lower section of West River Trail. Beautiful work! 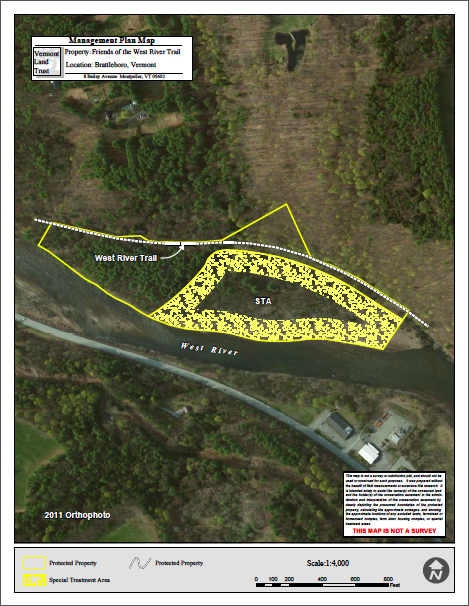 Click the link above to view a presentation of the River Stone Preserve. At the recent annual meeting, FWRT board members Lester Humphreys and Paul Cameron gave a presentation on the Riverstone Preserve, a 23-acre parcel which the group acquired in 2013. The land sits one mile north of the Marina restaurant in Brattleboro, between the West River Trail and the river itself. The southern section subcommittee purchased the land for $97,000. One-third of the purchase price was raised in donations and the rest came from a grant from the Vermont Housing Conservation Board. The Vermont Land Trust holds a conservation easement on the property. Cameron gave an overview of the plant communities in the Riverstone Preserve, which include a sugar maple ostrich fern flood plain community; a river shore grassland that is home to several rare plants such as the great lobelia; and a river cobbleshore, where the FWRT are working to control invasive Japanese knotweed, the worst of several invasive plant species in the preserve. Cameron also reported that last spring a volunteer group formed to develop a management plan for the preserve. So far the group has completed a drainage project, built a trail connector with a board walk, removed an old shed, and continues to work removing invasive species. FWRT would like to build stone steps, picnic table, a pavilion or shelter of some type, and an information kiosk. More volunteers are needed for projects happening this summer, please be in touch if you are interested in volunteering.